Denise Middler with son, Owen. A north-east mother, who feared she could not have children due to a painful chronic health condition, has donated money back to the fertility centre which gave her the gift of life. 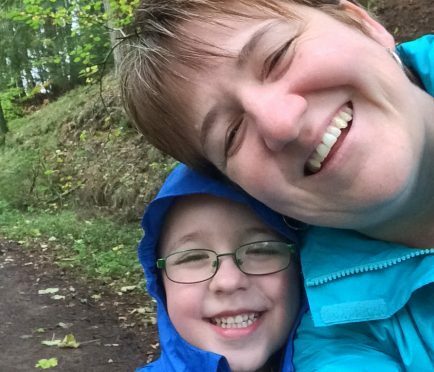 Denise Middler, 42, from Huntly, who suffers from endometriosis, now has a five-year-old son, Owen, following a successful round of IVF treatment. She has taken part in a series of challenges to raise money throughout 2017 for causes close to her heart and, this month, presented the Foresterhill-based centre in Aberdeen with a cheque for almost £4,000. She said: “I have suffered for many years with endometriosis – a condition [affecting the uterus] which has put me in hospital a number of times. “I was told in my 20s I would have major issues becoming a mother. We were referred to the Aberdeen Fertility Centre and started IVF treatment in my 30s. “The staff are very knowledgeable, understanding and easy to talk to. I never felt on my own. “That was hugely important when our first two cycles of treatment were unsuccessful. It was absolutely soul-destroying and very upsetting. “But the centre discussed with us the possible reasons it had been unsuccessful and gave advice on certain things that might aid the success of future cycles. At the beginning of the year, Mrs Middler, a technical manager at Smith Bakers in Huntly, embarked on one challenge a month to raise money for various charities. In the end, she completed 16 tasks, ranging from 5k and 10k runs, to muddy obstacle course challenges and triathlons. She capped it with a dinner dance in Inverurie and raised £3758.05 for the centre. She added: “I made my decision to give something back as soon as I had Owen. I didn’t know what I would be able to do, but I wanted to show them how grateful I was to become a mum.